If you are looking for a cat that has a personality as colorful as its coat, you may be interested in learning more about the Oriental Shorthair. This cat was bred to have just about every possible color and pattern, and it is loaded with personality. This is a cat that wants nothing more than to have constant contact with its people. They form a very special bond with their people, and will always find ways to get their attention. The Oriental Shorthair is a great family pet, and one that loves to play as much as it loves to cuddle. How much does a Oriental Shorthair Cat cost? As mentioned in the introduction, the Oriental Shorthair was bred to have any type of coloration and pattern. In the 1950s and 1960s, British cat breeders were particularly fond of the body type of the Siamese cat, which was originally from Siam, now known as Thailand. They began crossing Siamese cats with British Shorthairs and Russian Blues to achieve what we now know as the Oriental Shorthair. It wasn’t long before American breeders created their own version of this breed, but they did it with a cross between Siamese and American Shorthairs and Abyssinians. The Oriental Shorthair was originally bred in Britain and in the US in the 1950s and 1960s, and by 1972, it was accepted for registration by the Cat Fanciers Association (CFA). In 1977, it was given full championship status, and in 1985, Championship status was given to the long-haired version by the International Cat Association. In 1988, the Longhair Oriental received CFA registration. Both the Oriental Shorthair and the Longhair are referred to as the Oriental division by the CFA. 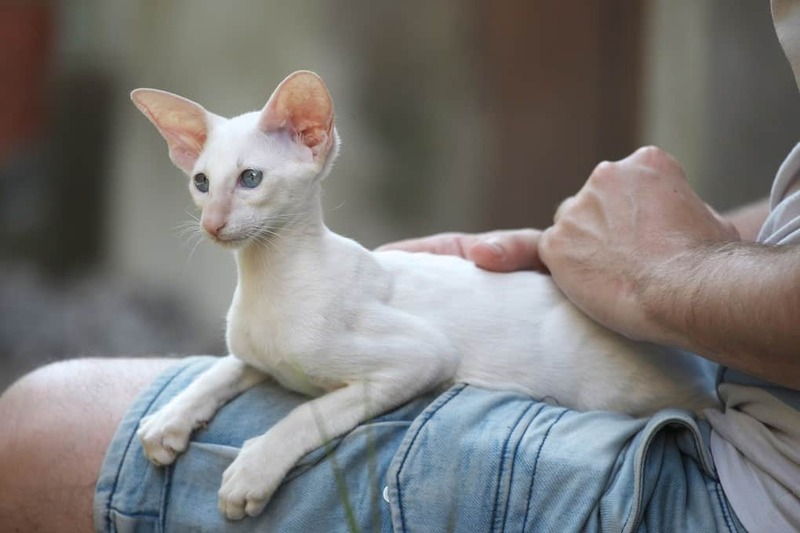 Now we are going to take a look at the physical standards of the Oriental Shorthair, including size, weight, and any health problems that may be common to the breed. These are relatively healthy cats, and they enjoy a lot of physical activity. They also need their down time, and love to snooze on laps. As previously mentioned, the Oriental Shorthair is a rather healthy cat. In general, these cats enjoy good health, but there are a couple of issues that are common to this breed. They do have a tendency to develop a condition known as endocardial fibroelastosis, and a problem with the protrusion of the cranial sternum. One of the great things about any type of shorthaired cat is that they don’t require a lot of grooming. Cats are generally pretty good at keeping themselves clean, and they spend a lot of time grooming themselves. It is still a good idea to get into the habit of brushing your cat at least once a week. This is going to get rid of old hair, dead skin cells, etc. so there are fewer allergens in the home. The Oriental Shorthair is a tall cat with a very flexible body. They can grow up to about 12 to 15 inches in height at the head, much like their ancestor, the Siamese cat. When this cat stretches out to its full length, it is very long indeed. This is a cat that is lean and muscular, and isn’t going to become overly heavy. If you have a male that exceeds 10 pounds, or a female that exceeds 8 pounds, chances are your cat is overweight. If you want a cat that is highly intelligent and very active, the Oriental Shorthair is a great choice. These are very smart cats, and they can even be trained to play fetch and walk while on a leash. They love to play as much as possible, particularly when you are interacting with them. In fact, they need play time with their owners and other pets, because they adore as much companionship as they can get. There really is no such thing as a hypoallergenic cat, but some are better for people with allergies than others. 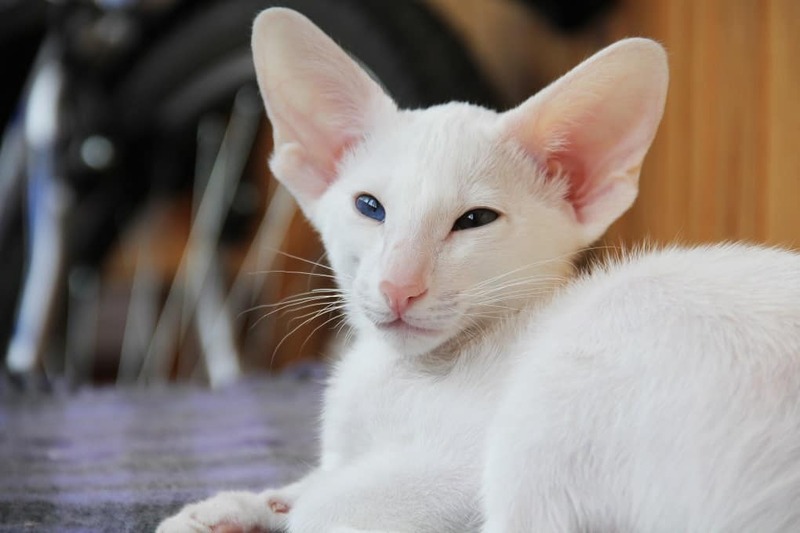 For instance, a breed such as the Oriental Shorthair is ideal for someone with allergies, because there is not going to be a lot of fur flying around the house. With proper care, an Oriental Shorthair can live up to 15 years. Some have been known to be quite a bit older. Typically, it depends on the cat itself, its overall health, its diet, and making sure that you are providing regular veterinary care for your pet. Caring for an Oriental Shorthair is really not much different from caring for any cat. They need to have constant access to fresh water, and be fed a diet that is healthy and well balanced. You can talk to your vet about which foods are best to feed to your cat, along with taking it in for regular checkups. 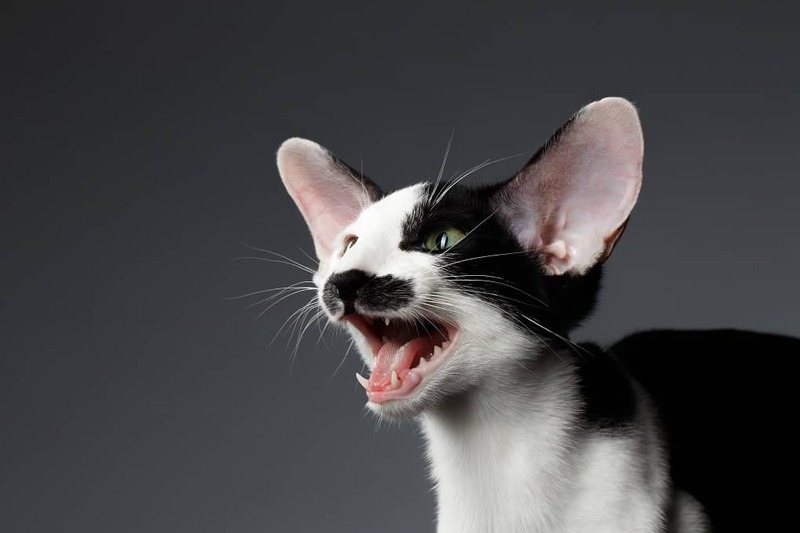 If you are looking for a purebred Oriental Shorthair, your best bet is to seek out responsible breeders. If there are no breeders of these cats in your area, you may need to expand your search. It is important that you thoroughly research breeders, and ask the right questions to make sure that they are selling healthy animals. Another option is to start checking at local animal shelters. While there is never any guarantee of the types of cats that will be available, it is not uncommon to see pedigreed cats sitting in shelters. Plus, you will be adopting a cat that really needs you. If you are getting your cat from a breeder, you can expect to pay anywhere from $400 to $500 for a kitten that is healthy and of good quality. Of course, this depends on the breeder, and whether or not the cat is a kitten or an adult. Make sure the breeder is CFA certified, and that it has a health certificate from a vet. Now that you have decided that you want to make an Oriental Shorthair part of your family, you have an even more difficult decision to make. What type of Oriental Shorthair are you going to get? They come in so many different colorations and patterns, and they are all incredibly beautiful, with their bright, green eyes and sleek coats. While some people base their decisions on appearance alone, we recommend basing your decision on both appearance and personality. Like any pet, an Oriental Shorthair does require a certain amount of care and attention. Because they are a lean animal, they need a diet that is going to help them to stay lean and healthy. It is also important to make sure that they get plenty of exercise, which can be in the form of playtime with you. You also need to be responsible for proper veterinary care. Don’t wait until your pet is sick before taking it to the vet. Finally, it is always best to keep your cat indoors. Indoor cats have longer lifespans than outdoor cats. Every type of cat has its own particular characteristics, and then every cat has its own as well. The Oriental Shorthair is no exception. Let’s take a look at the characteristics of the Oriental Shorthair. Generally, the Oriental Shorthair is a well behaved and loving cat. But, if it is not getting the attention it constantly craves, it may start to get a bit peevish. This cat can be black, blue, brown, lilac, red, and other colors. It can have solid coloration, or tortoiseshell, bicolor, smoke, shaded, tipped, tabby, and other patterns. The Oriental Shorthair loves attention, and if you give it plenty of love, it will give it back and then some. They also love to entertain their people, and are very playful. This is a great cat to have around children, and they will play with the kids all day if you let them. They also enjoy being with other cats, and can get used to dogs. The Oriental Shorthair is highly intelligent, and very inquisitive. It also loves to “talk,” and will take great pleasure in having conversations with you. This is a high-energy cat, and therefore you will need to make sure it gets plenty of exercise. If you want a low maintenance cat with few health issues, the Oriental Shorthair is an excellent choice. There is really only one type of Oriental Shorthair, but this breed can be found in a wide array of colors and patterns. In fact, there are more than 300 known patterns found on Oriental Shorthairs. If you are looking for a particular color or pattern, you will need to seed out breeders who specialize in what you want. Personality-wise, there is really no difference. Like all cats, they each have their own individual personality, and the type has no relevance here. If you love the look of a Siamese cat because of their body shape, but you want a cat that has a different color or pattern, the Oriental Shorthair is definitely one to consider. Both types of cats have similar body types. They are long and lean, and have sweet faces. The only real facial difference is the eye color, with Siamese cats having blue eyes and Oriental Shorthairs having green eyes. Owning an Oriental Shorthair is a lot like bringing another child into your home. They do require a lot of attention, and they love to spend every waking moment with the people they love. These cats want to watch whatever you are doing, and whenever possible, take part and even “help.” They have plenty of energy and love to play, but they also love to cuddle, a lot. They are relatively easy to care for, and don’t tend to have a lot of health problems. This is a wonderful family pet, and it is going to get along with children and other pets.